Investigate Nelkir's story of a Whispering Lady behind a locked door. You know her, don't you? Talk to the innkeeper of The Bannered Mare in Whiterun. Ask Jarl Balgruuf the Greater about his children. Investigate the door in the basement. Acquire the key from the Balgruuf the Greater or Farengar Secret-Fire. After hearing rumors from the publican at The Bannered Mare about one of the jarl's children acting strangely, you can ask the jarl, Balgruuf the Greater, about it. He will express concerns that his youngest son, Nelkir, has become exceptionally brooding: "Yes, my youngest son. He's a dark child. I don't know what to do with him. He was always a quiet lad, but lately... something has changed. He's become brooding. Violent. He won't say a word to me, but I don't know how I upset him. If you could speak to him. Draw out the truth. I would be immensely grateful." When you talk to Nelkir, he will be surprisingly forthcoming about numerous family secrets, stating that his father hates the Thalmor, worships Talos, and that Nelkir himself has a different mother than his siblings. He will also mention that a door in the basement of the castle is whispering to him and helping him learn how to sneak around the castle. He suggests that the door might talk to you too. The door is actually well hidden in plain sight off the main hall of Dragonsreach. In order to find it, go into the kitchen. Proceed down the stairs and open the closet door in the small servant's room. At the back of the closet is a locked door which seems to be covered in blood. Activate the door, and the disembodied voice of the Whispering Lady will begin talking to you. She reveals herself to be the Daedric prince Mephala, and tells you that some of her power is locked behind the door and that she needs you to release it. She had been corrupting Nelkir, but found limits to what she could accomplish with a child. You, though, have promise. She will tell you to ask Nelkir how you can go about getting the key to the door. Nelkir will tell you that only the jarl and the court mage, Farengar Secret-Fire, possess a key to the Whispering Door, and suggests that Farengar will not be missed should he disappear. You can pickpocket the Whispering Door key off either Farengar or Balgruuf, or you can follow the child's dark advice to kill Farengar and take it from his corpse. When you have the key, head down to the basement and open the door, which reveals a small room with a sword and a book resting on a table. The book, Admonition Against Ebony, warns you against taking the sword lying next to it; however, to complete the quest, simply ignore the warning and pick up the sword. Mephala will tell you that it is the Ebony Blade, but that its power has been locked away for too long. 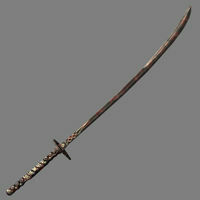 If you choose to restore the blade, it requires staining with the blood of treachery. However, the blade's restoration is not necessary to complete the quest, simply its retrieval. Also, while you do not receive any further information on Nelkir's condition, if there are any subsequent interactions there seems to be an improvement in disposition. If Hulda and Ysolda die, you cannot get this quest. Version 1.5 of the Official Skyrim Patch marks Ysolda as essential. The quest is still available if you have completed Battle for Whiterun for the Stormcloaks. Jarl Balgruuf will move from Dragonsreach to the basement of the Blue Palace, but his dialogue will not change and the quest can still be completed normally. Hulda is necessary for this rumor to unlock. Ysolda can take over as publican of The Bannered Mare if Hulda dies, but will not give the rumor. This issue has been addressed by the Unofficial Skyrim Patch; Mikael will replace Hulda instead of Ysolda, as he has dialogue to give the quest. Speaking to the jarl and asking about his kids will not activate this quest. You must have completed the Dragon Rising quest to receive the rumor from Hulda. Killing followers or friends will increase the blade's drain health effect—see the Ebony Blade page for more detail. Despite Farengar being allegedly aware of the blade, you can sell it to him. Several elements in the Creation Kit seem to indicate that a portion of the quest was omitted from the final game—it appears that Jarl Balgruuf's children were supposed to fall under Mephala's influence one by one, culminating in them killing Balgruuf in an act of patricide. It seems that his brother Hrongar would have replaced him as jarl upon death, given that he has unused dialogue mirroring Balgruuf's for several quests, and some citizens of Whiterun, like Ulfberth War-Bear have unused dialogue referring to Hrongar as jarl. If Farengar dies before the quest starts you can not get the key from his urn in the Whiterun catacombs. If you attempt to enter the room behind the Old Wooden Door using the "Platter Exploit" before you have completed the necessary steps in the quest you will find a floating drawer (labeled "End Table") blocking your entry into the room. The sword however can still be seen on top of the table where it usually sits. Hulda may not show any new rumors available after you are level 20. Try talking to her anyway; she may give you an old rumor, then follow up with this one. If this does not work, the console command setstage DA08 10 will initiate the quest and give you a quest marker to speak to Nelkir. There may not be a dialogue option with the jarl after receiving the quest. If you are a vampire at the moment of speaking with Hulda, she won't immediately give you the rumor; instead, she will suggest you visit Falion to cure your vampirism first. However, she will give the rumor after asking for gossip and then rumors once more. 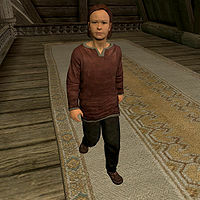 10 Balgruuf the Greater, Jarl of Whiterun, has a troubled child. He's asked me to help the boy. 25 Mephala, the Lady of Whispers, has tasked me with releasing the Ebony Blade from its prison. 60 Finishes quest I have received Mephala's Ebony Blade, but it lacks its legendary powers. To restore it, I must use it to slay those who are close to me. Finishes quest I have received Mephala's Ebony Blade, but it lacks its legendary powers. To restore it, I must achieve great infamy and hatred in this land. 80 I have restored Mephala's Ebony Blade to its full potential. On the PC, it is possible to use the console to advance through the quest by entering setstage DA08 stage, where stage is the number of the stage you wish to complete. It is not possible to un-complete (i.e. go back) quest stages, but it is possible to clear all stages of the quest using resetquest DA08. This page was last modified on 30 January 2019, at 22:10.